I was fretting and feeling unprepared for an upcoming conference. Despite words of encouragement, I let doubt get the best of me. Even though you can feel it creeping into your soul and you try to push it back, you wonder if that doubt is your intuition trying to give your mind some honest feedback. You know, a warning to prevent you from heartache or distress. I am grateful to have the Lord providing spiritual prompting on this journey. At times that I feel like I have started down a path that is about me and not His plan, He gives me tangible evidence as encouragement to trust Him. Last night was the first conference call with P31 ministries for the upcoming writers conference. Learning all that needs to be prepared before I attend was leaving me in a cloud of self-doubt. Why was I so foolish to invest in this conference this year? A friend of a friend has attended this conference twice. She recently assured me that I would get so much out of the conference; it will be like drinking from a fire hose. Her advice was to simply pray that God will show me what my takeaway will be. I am grateful to have made this recent connection. I am also grateful for the many women’s conferences I have attended and business conferences with Stampin’ Up!. As I listened to the call last night, it was clear that I would have much to do to prepare my heart and mind for the conference. I trust God has indeed called me to take this step at this time and has given me past experience to filter the conference material so I will not be over-whelmed. Anticipating a trip or a journey is humbling. There is a balance we need to manage to keep excitement and preparedness in check before we set out. I have been in a place where my expectations were set too high before an adventure. For this particular feat, I am fully relying on His guidance. I know He put me in a place to register this year for a reason. My business life with Stampin’ Up! has taught me a great deal about investing myself toward a goal while not expecting immediate results. The assurance placed on my heart last night and into this morning is to follow the advice I was given and to pray my way through to see His plan and purpose. I struggle to converse about the conference as I am in the midst of a faith walk. If I try to put the destination into words for human comprehension, I will encounter a tidal wave of cautionary advice. This has got to be between God and me for the plans to roll out according to His plan and purpose. 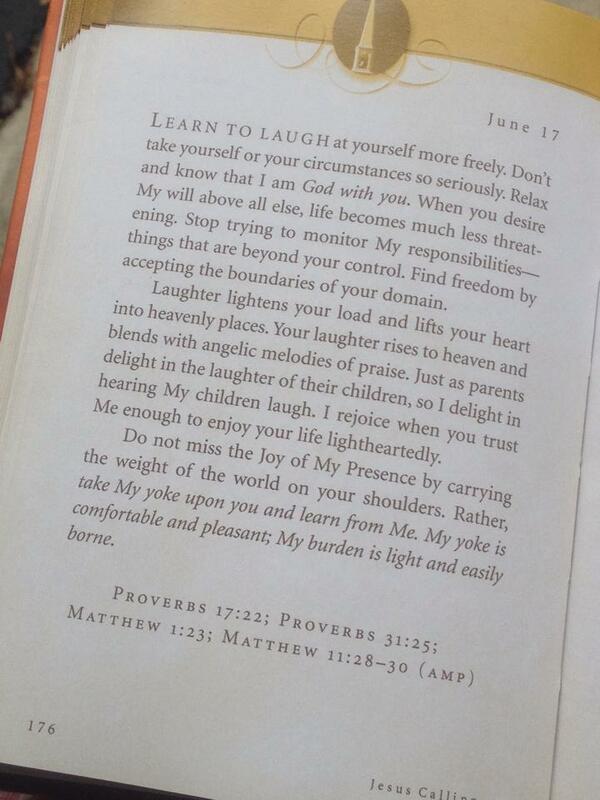 I do want to share the tangible word He offered me this morning through a favorite devotional, “Jesus Calling”. As I have been doing for several months, I am not focused just on the key scriptures Sarah Young provides, I try to read in front and behind this scripture for the nourishment I need to absorb. In Proverbs 17:27 I read, “Those with knowledge know when to be quiet, and those with understanding know how to remain calm.” Reassurances to be still, to be quiet, don’t fret—He has this one covered. I am led. I have found the P31 verse to be a bit intimidating over the years. Of late, He is showing me new words of encouragement. [If He blesses me with maidservants, I will gladly rise early to make them breakfast.] Verse 25 has been popping up quite a bit in the last few months. He is using this to assure me. Again, the word that I see is “she THINKS about the future”. Note, she doesn’t rattle on about her plan and how God is leading her. She simply follows His plan and purpose. He will provide and protect and He WILL get the glory. Want to laugh? The words that stood out this morning are ‘perfectly fitted to your curves’. Just before I sat down for my morning reading, my dear husband came into the bathroom where I was drying off from my shower. I know, I know… this is too much information but I love that God used those very words from His lips this morning and then tied them into my meditation with Him a few moments later. I have told you before that God is quite exact when He communicates with me; this morning was a perfect example. I was further reassured when a friend posted an image of this very scripture as I started to write todays post. Often when we hear reference to Matthew 11:28-29, the context relates to finances. Just this past Sunday, our Pastor delivered another stellar message that nailed the pondering of my mind and concerns of my heart. Just the night before I had a brief conversation with a fellow ‘church lady’ about raising mission funds, debt recovery, and the marriage ‘yoke’. Ah, God is good! He is showing me how to connect the dots in His plan. I am so in love with Him! Thanks for letting me share today. It is good to journal my personal journey so others might be encouraged on their walk. If there are prayer warriors reading, can you lift me up in prayer? Pray for discernment in my written and spoken words. Pray for discernment in my time management as I prepare for the conference. Pray for discernment in my time management as I prepare while managing family life, a full-time job, a sideline business, and… oh, please pray! Pray for protection from spiritual warfare for me and my family as I step out in faith. Pray for guidance on the topic He wants me to lead off writing (and when). Pray for building a platform. What is a platform? It is a following. As an introvert, I haven’t desired a spotlight. I realized on the call last night I need earnest followers of the blog so the publishers know I have an audience. I simply want to reach those who need to hear what I am led to write. Can you pray for me in this regard? Today I opened a Facebook page to connect with the blog. I will begin to link blog posts to this page to share with a public audience [yikes]. I will maintain my personal page for my personal life as I have done for my SU! business. I am not sure how much of a crossover there will be. I do wish to be a positive encouragement to all who my life touches. Lord knows I need to catch up for many years of negativity! Thanks again, for letting me share a little of my personal journey today.